Canon Inc. (キヤノン株式会社, Kiyanon Kabushiki-gaisha) is a Japanese multinational corporation specializing in the manufacture of imaging and optical products, including cameras, camcorders, photocopiers, steppers, computer printers and medical equipment. It's headquartered in Ōta, Tokyo, Japan. The company was originally named Seikikōgaku kenkyūsho (Jpn. 精機光学研究所, Precision Optical Industry Co. Ltd.). In 1934 it produced the Kwanon, a prototype for Japan’s first-ever 35 mm camera with a focal-plane-based shutter. In 1947 the company name was changed to Canon Camera Co., Inc., shortened to Canon Inc. in 1969. The name Canon comes from Buddhist bodhisattva Guan Yin (観音, Kannon in Japanese), previously transliterated as Kuanyin, Kwannon, or Kwanon in English. The origins of Canon date back to the founding of Precision Optical Instruments Laboratory in Japan in 1937 by Takeshi Mitarai, Goro Yoshida, Saburo Uchida and Takeo Maeda. During its early years the company did not have any facilities to produce its own optical glass, and its first cameras incorporated Nikkor lenses from Nippon Kogaku K.K. (the later Nikon Corporation). Between 1933 and 1936 ‘The Kwanon’, a copy of the Leica design, Japan’s first 35 mm focal-plane-shutter camera, was developed in prototype form. In 1940 Canon developed Japan's first indirect X-ray camera. Canon introduced a field zoom lens for television broadcasting in 1958 and in 1959 introduced the Reflex Zoom 8, the world’s first movie camera with a zoom lens, and the Canonflex. In 1961 Canon introduced the Rangefinder camera, Canon 7, and 50mm 1:0.95 lens in a special bayonet mount. In 1964 Canon introduced the 'Canola 130', the first Japanese made 10-key calculator, a substantial improvement on the design of the British Bell Punch company, which introduced the first fully electronic calculator two years earlier with the Sumlock Anita Mark 8 unit. 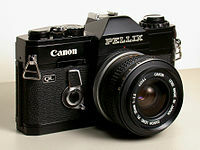 In 1965 Canon introduced the Canon Pellix, a single lens reflex (SLR) camera with a semi-transparent stationary mirror which enabled the taking of pictures through the mirror. In 1971 Canon introduced the F-1, a high-end SLR camera, and the FD lens range. In 1976 Canon launched the AE-1, the world’s first camera with an embedded micro-computer. In 1982 "Wildlife as Canon Sees It" print ads first appeared in National Geographic magazine. Canon introduced their Inkjet printer using bubble-jet technology in 1985. (1 year after HP) Canon introduced Canon Electro-Optical System (EOS) in 1987, named after the goddess of the dawn. EOS 650 autofocus SLR camera is introduced. Also in 1987 the Canon Foundation was established. In 1988 Canon introduced 'Kyosei philosophy'. The EOS 1 Flagship Professional SLR line was launched in 1989. In the same year the EOS RT, the world's first AF SLR with a fixed, semi-transparent pellicle mirror, was unveiled. In 1992 Canon launched the EOS 5, the first-ever camera with eye-controlled AF, and the PowerShot 600, its first digital camera. In 1995 Canon introduced the first commercially available SLR lens with internal image stabilization, EF 75-300mm f/4-5.6 IS USM. Canon EOS-RS was the world's fastest AF SLR camera with a continuous shooting speed of 10 frame/s at the time. Based on the EOS-1N, the EOS-1N RS has a fixed, semi-transparent pellicle mirror with a hard coat. In 1996 Canon introduced a pocket-sized digital camera with the Advanced Photo System, named ELPH in America and IXUS in Europe. Canon entered the digital video camcorder market in 1997. In 2004 Canon introduced the XEED SX50 LCD projector. Canon introduced its first high-definition camcorder in 2005. In November 2009 Canon made a €730 million (US$1.1 billion) all-cash offer for the Dutch printer maker Océ. Canon had acquired majority ownership of Océ by March 2010, and completed the acquisition of 100% of shares in Océ by the end of 2011. In 2010 Canon acquired Tereck Office Solutions, Inc.
On 16 March 2010, Canon announced that it was seeking to acquire a new .canon generic top-level domain, acquiring it in February 2015 and using it for the first time on its global website in May 2016. In the third quarter of 2012, Canon's global market share in the sale of printers, copiers and multifunction devices was 20.90 percent. In early 2013, Canon USA moved into a new $500 million headquarters in Melville, New York. In February 2014, Canon announced it would acquire Texas-based Molecular Imprints Inc, a developer of nanoprint lithography systems, for an amount speculated to be around $98 million. On 13 June 2014, Canon announced it had acquired Danish IP Surveillance VMS software company Milestone Systems. Milestone provides open-platform software to allow video management from various vendors in a single interface; therefore the company will operate as a separate entity. On 10 February 2015, Canon announced that it had intentions to buy Swedish Security Camera maker Axis Communications for $2.83 billion. On 23 February 2015, Axis Communications reacted to this news and confirmed that it had received a purchase proposal from Canon. The purchase was effectively completed in April 2015. On 24 April 2015, Canon Europe announced it had acquired the London-based family photo sharing startup Lifecake. In November 2015, Canon USA filed lawsuits against a number of camera gear retailers in an attempt to stop the sale of gray market camera gear. Retailers include Get It Digital, All New Shop and F&E Trading. In March 2016, Canon acquired Toshiba Medical Systems Corporation for $5.9 billion. On 28 March 2017, Canon Europe announced it had acquired the London-based printing startup Kite. On 2 April 2019, Canon introduces two new UHDgc 2/3-inch Portable Zoom Lenses designed For 4K UHD Broadcast Cameras. The "Business Solutions" division offers multi-functional printers, black-and-white and color office printers, calculators, presenters, large-format printers, scanners, black-and-white and color production printers, as well as software to support these products. DeVito/Verdi was hired for an award-winning, humorous campaign with the concept "If business were that easy, you wouldn't need us," using old office footage to describe the new ways Canon Business Solutions was bringing copiers and office supplies forward. Lesser known Canon products include medical, optical and broadcast products, including ophthalmic and x-ray devices, broadcast lenses, semiconductors, display and semiconductor manufacturing equipment, digital microfilm scanners and handy terminals. Due to consumers switching from compact cameras to smartphones, Canon's Q1 2013 operating profit fell 34 percent year-on-year. Canon's largest division in terms of revenue is its multifunction copier division. Canon distributes its consumer and home office imageCLASS line though retail outlets and professional-grade imageRUNNER series through subsidiary Canon Solutions America and independent distributors. The professional-grade series ranges from small table tops to large digital presses. For many years, Canon was the principal maker of the print engines found in industry-standard laser printers. The first models of Apple LaserWriter and the equivalent products made by HP used the Canon LBP-CX engine. The next models (LaserWriter II series, LaserJet II series) used the Canon LBP-SX engine. Later models used the Canon LBP-LX, LBP-EX, LBP-PX engines and many other Canon print engines. Current printers use the proprietary BJNP protocol (USB over IP port 8611). Canon produces a range of high-output flash units for its DSLR cameras, including the 270EX, 320EX, 430EX, 580EX and 580EX II Speedlites and the Canon 600EX-RT Speedlite. Canon also produces macro flash units including the Macro Twin Lite and the Macro Ring Lite. Canon manufactures a wide range of flatbed scanners, film scanners and document scanners for home and business use, including the Canon Canoscan 8800F. Some of its scanners employs LED inDirect Exposure (LiDE) technology, such that USB port is suffice to power the scanner, and no additional power is required. Canon introduced two MSX home computer models in 1983, the V-10 and the V-20. Both offered just the minimum range of the MSX standards without any additional features. The V-20 was able to receive shooting data from the T90 Canon camera with the Data Memory Back T90 expansion. Canon also sold a Canon AS400 PC 640x480 color display computer, shortly before the release of the IBM PC. It was based on the Intel 8086 processor and used CP/M or MS-DOS. Options included a 5 MB hard drive. Canon produces a wide range of award-winning projectors. Canon produces a wide range of calculators in various applications, including handheld calculators, desktop calculators, printing calculators and scientific calculators. Canon offers a full range of wireless presenters, from advanced green laser presenters with back-lit screen display to basic red laser presentation clickers. Canon is developing a prototype virtual reality headset (Canon VR). The headset offers a wider viewing angle (120 degrees) than other VR devices but requires handles rather than a head strap. The headset is not yet available on the market. Canon's world headquarters is located at 30-2 Shimomaruko 3-chome, Ohta-ku, Tokyo 146-8501, Japan. Canon has regional headquarters in America, Europe, Middle East, Africa, Japan, Asia and Oceania (including Australia & New Zealand). Canon Europe has two principal subsidiaries: Canon Europa NV (based in Amstelveen, Netherlands) and Canon Europe Ltd. (based in Uxbridge, UK). the Industry and Others Business Unit (the products of which include computers, handy terminals, LCD lithography equipment, magnetic heads, medical imaging equipment, micromotors, ophthalmic equipment and semiconductor lithography equipment). On 26 December 2003, Canon Inc. announced restructuring plans for three domestic Canon Group companies. The restructuring involved the merger of two companies and the spinning off of one. Canon generated total revenues of US$45,608 million in 2011, of which 53.9% was by the Office Business Unit, 36.9% by the Consumer Business Unit and 11.8% by the Industry and Others Business Unit. [note 1] In the same year, 31.3% of revenues were generated in Europe, 27.0% in the Americas, 22.2% in Asia and Oceania (ex. Japan) and 19.5% in Japan. Canon invested a total of US$3,946 million in research and development in 2011, equivalent to 8.7% of sales. In 2011, Canon was granted 2,813 patents in the United States, the third-highest number of any company (after IBM and Samsung Electronics). A report by the environmental organization Clean Air-Cool Planet puts Canon at the top of a list of 56 companies the survey conducted on climate-friendly companies. Canon has also launched three new calculators in Europe, called "Green Calculators", which are produced in part from recycled Canon copiers. The company has a corporate social responsibility strategy in Europe named ‘Green is just a shade of blue’. The strategy places emphasis on green issues being ‘a small part of the bigger, bluer picture’, and therefore gives equal importance to other areas, including ethics, attitudes, humanitarian aid and disaster relief, education, science and social welfare. In 2008 Canon donated financial support to help the estimated 5 million people displaced by the earthquake that hit China’s Sichuan province in May 2008. RMB 1 million was donated to the Red Cross Society of China shortly after the earthquake. Canon Inc, Japan, soon followed with a donation of RMB 10 million. In 1983 came the first title sponsors of the English football league The Football League, which was named The Canon League from 1983 to 1986, when the sponsorship was taken over by the Today newspaper. From 1967 to 2003 Canon sponsored the Greater Hartford Open [Now Travelers Championship]. Since 2006 Canon has been helping the Red Cross provide support to 13 Red Cross National Societies across Europe, with focus on youth projects. Support from Canon includes financial contributions and donations of imaging equipment, including cameras, copying machines and digital radiography devices, as well as volunteer activities. Canon Europe has been a partner of World Press Photo for 16 years. World Press Photo promotes the professional standards in photography; organises the largest international contest for professional photojournalists; and acts as a worldwide platform for press photography. Canon Asia sponsored many competitions such as Canon Photomarathon and reality TV show Photo Face-Off. The latter is a reality TV show in which professional photographer Justin Mott is the judge and competes against amateur photographers. Justin started filming season 3 in April 2016 and that season aired at the end of that same year. ^ Percentages do not add up to 100% due to eliminations used in consolidated accounting. ^ a b c d e "Canon Annual Report" (PDF). Canon. ^ "Canon Historical Data (consolidated)" (PDF). Retrieved 9 February 2010. ^ "Corporate Profile." Canon. Retrieved on 13 January 2009. ^ a b "The History of Canon 1933 - 1961". Archived from the original on 13 March 2010. Retrieved 2 November 2014. ^ "History Hall 1937-1945". Canon Camera Museum. Archived from the original on 10 June 2017. ^ "Kwanon name". canon.com. Retrieved 2 October 2017. ^ "'Kyosei philosophy'". Canon.com. Archived from the original on 7 March 2009. Retrieved 18 April 2012. ^ "History Hall 1987-1991". Canon Camera Museum. ^ "History Hall 1992-1996". Canon Camera Museum. ^ ProjectorCentral News. "The XEED SX50 – Canon’s new SXGA+ super-compact Multimedia Projector." 23 Sep 2004. Retrieved 21 February 2017. ^ Hanlon, Mike (18 September 2005). "Canon's High Definition Video Camera - the XL H1". New Atlas. Retrieved 21 February 2017. ^ Nicholson, Chris V. (16 November 2009). "Canon to Buy Océ, the Biggest European Printer Maker". The New York Times. Retrieved 29 March 2013. ^ "Canon's Takeover of Oce Completed". Industry Week. 4 March 2010. Retrieved 29 March 2013. ^ "Canon to Combine $1 Billion Oce Purchase After Delay". Bloomberg. 2 April 2012. Retrieved 29 March 2013. ^ "Canon U.S.A. Acquires North Carolina-Based Tereck Office Solutions, Inc". Taume News. 17 May 2010. Archived from the original on 16 July 2011. Retrieved 18 May 2010. ^ "Canon Global : News | News Releases". Canon.com. 16 March 2010. Retrieved 18 April 2012. ^ "Canon launches renewed global website using new '.canon' top-level domain name". ^ "Multi-function units out-compete printers – Print industry crisis". tonerfabrik.com. Retrieved 2 October 2017. ^ Madore, James T. (18 February 2013). "Canon Moves In". Newsday. p. A4. ^ "A picture-perfect move". Newsday. 20 February 2013. p. A31. ^ Kim, Chang-Ram (18 February 2014). "Canon says to buy U.S.'s Molecular Imprints". Reuters. Asia. Retrieved 18 February 2014. ^ "Canon Acquires Milestone to Make Major Advance in Network Video Surveillance Business". 13 June 2014. ^ "Canon's shocking acquisition of Axis: is security industry turning tide?". SourceSecurity.com. ^ "Canon-Axis deal done despite hedge-fund holdout". Security Systems News. Retrieved 2 October 2017. ^ "Canon Acquires London-Based Family-Photo Sharing Startup Lifecake". Techcrunch. ^ "Canon Europe acquires Lifecake to accelerate growth in digital consumer services". ^ By Michael Zhang, PetaPixel. "Canon is Suing Gray Market Camera Gear Dealers." 23 November 2015. 15 December 2015. ^ Pavel Alpeyev, Takashi Amano (17 March 2016). "Toshiba Gets $5.9 Billion Deal to Sell Medical Unit to Canon". Bloomberg.com. ^ "Canon acquires London-based printing tech startup Kite". Techcrunch. ^ "Canon Europe acquires Kite.ly to expand mobile printing capabilities". ^ Inc, Canon U. S. A. "Canon Introduces Two New UHDgc 2/3-inch Portable Zoom Lenses Designed For 4K UHD Broadcast Cameras". www.prnewswire.com. Retrieved 3 April 2019. ^ "Canon Q1 operating profit dips on weaker compact camera sales". Reuters. 24 April 2013. ^ "Canon Projectors: Awards". projectors.usa.canon.com. Retrieved 2 October 2017. ^ "Eyes on with Canon's handheld VR headset". stuff.tv. Retrieved 13 October 2015. ^ a b c d e "Annual Report 2011" (PDF). Canon. Retrieved 8 December 2012. ^ "Canon Group Announces Restructuring in Japan". Archived from the original on 28 April 2005. ^ Zabarenko, Deborah (19 June 2007). "Reuters report". Reuters. Retrieved 18 April 2012. ^ "Canon Europe - Think green: Canon launches recycled calculator range". Archived from the original on 5 July 2008. Retrieved 2 October 2017. ^ "Environmental Activities | Canon global". canon.com. Retrieved 2 October 2017. ^ a b "Canon relief efforts for 2008 Sichuan earthquake". Retrieved 4 July 2014. ^ "Canon and the Red Cross". Canon Europe. Retrieved 2 October 2017. ^ "World Press Photo sponsorship". Canon Europe. Retrieved 2 October 2017. ^ "Photo Face-Off Casting". casting.historyasia.com. Retrieved 18 March 2016. Wikimedia Commons has media related to Canon.